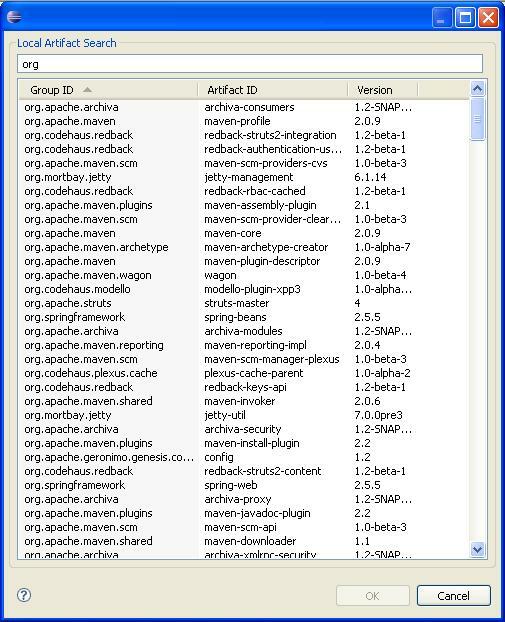 IAM now supports searching for dependencies in any Apache Archiva managed repository, real time. In order to enjoy this feature, you need to run Archiva 1.2 or higher. Eclipse with IAM installed in it. You need to add a repository and then index that repository or upload artifact to any managed repository since the bundled repository of archiva is empty at first execution. In eclipse, go to Window->Preferences->Maven->Artifact Search->Archiva Artifact Search Preferences and fillthe required information. Username and Password allowed username and password. Connection Timeout (milliseconds) If iam cannot connect to the url above w/in the supplied time, an exception will be thrown and empty list is returned. Response Timeout (milliseconds) If the server response exceeded the supplied time, an exception will be thrown and empty list is returned. For testing purpose, you can disable other search providers by going to Window->Preferences->Maven->Artifact Search-> and ensure that on Archiva Artifact Search Provider is the only item that is checked. This page was last modified 16:10, 7 May 2009 by Carlos Sanchez. Based on work by Allan.